How are we a week into November already...this can only mean one thing that I share my October favourites with you! Here are my most used items for October. This is actually my first Aespo product I have used and I really like it. If you havent read my previous posts you will see I have a huge Aesop wish list here. As with a lot of these products you only need a tiny bit and it goes a long way. Very moisturising and 2 applications will last you the whole day so you don't have to keep reapplying. A few months back I was beginning to think Loccitane (hand creams) products no longer work for me. When I first used this brand a few years back I thought it was amazing but over the last 6 months I found myself reapplying it lots because my hands still felt dry. This one was a freebie from Marie Claire and it's doing an amazing job. I think for my skin I need to switch it up a little so my skin does not get use to it. If you suffer from dry hands this is a must purchase. You can see the prices here. 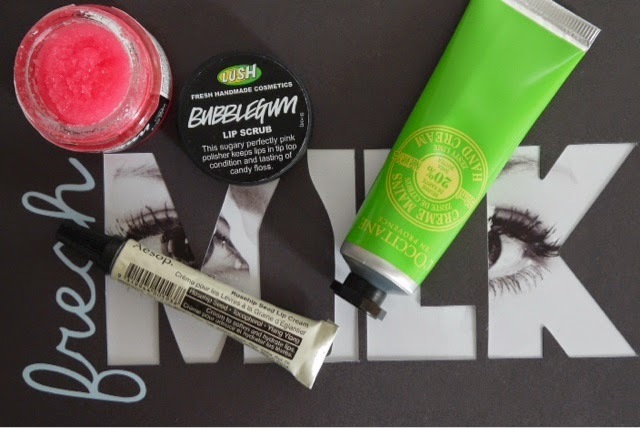 I received this Bubblegum Lip scrub* a few months back from a Lush bloggers event - you can read here. At the time I didn't really use it but as the days are getting colder I am finding myself using it after bath. It's great for shifting any dead skin on your lips, I find it most effective when used after shower / bath when your skin is already soft. There is also a popcorn flavour I want to try. Don't blame me for your spending!!!! Lip balm you only need to apply once or twice a day?!? Sign me up, also love the Aesop is a cruelty-free brand, will definitely be adding this to my wishlist. I had no idea they are cruelty free - thats amazing!!!! Thanks for stopping by Amber. Lets see what I pick up next week! Hopefully I will be reviewing just the 1 item, don't want to be going crazy shopping for myself! the aesop lip cream looks nice! is it better than Nuxe?? ?